Early start this morning. Up and at breakfast at 6:00 and meeting Ally at 6:30 to start the day. There is a story I want to share but have been waiting to see how it all turned out first. You know me, Ms organized and all. Packed for a few weeks, even unpacked and washed my clothes and repacked them. Took pictures of MOST EVERYTHING I was putting in my bag. But what did I forgot? What was the most important thing NOT to forget? The charger for my camera batteries. OMG! I had purchased a third battery just the day before I left, just to make sure I never ran out. Put in on the charger right beside my bed and I completely left home without it. It wasn’t until we were leaving Arusha for the airport to fly to the Seregeti that I discovered I didn’t have it. Saying I was devistated doesn’t even come close. Even though Rich had his camera, it just wasn’t the same. My lifetime dream and I was going to miss capturing ever minute. So I started talking to Ally about it and since there are multiple flights to the nearby airport where we would be staying, I asked if he thought ADS (my Safari company) would be willing to buy one and send it on a flight over and I would pay them when I get back to Arusha. He explained what happened and told them I needed a charger, etc. Thank the lord, they agreed. So Timan, one of the welcoming ADS employees, went and bought me one and put it on a plane so we could pick it up the next day (remember the day we went back to the airport and the presidents were flying in?) Well, that’s why we were there. I was so elated…I was saved. So flight arrives, Ally walks out to meet the pilot and he comes back with a small package in his hand…yeah! But it looked a little small to me. Opened it up and what they sent me was another battery, not the charger. Can you believe it? Now I have two completely dead batteries and one with only 3 notches left on the one left in my camera and no way to charge any of them. Ally called them right away and Timan then went to 5 different locations in Arusha and no one carried just the charger. Really? It’s a Nikon? Who doesn’t sell just a charger AND why can’t a Nikon battery recharge through your computer like most other devices? I was once again devistated :(. Then I got the grand idea to just buy another camera, it would come with the charger and I’ll just sell it but when/how would I get it? They once again agreed…I so love this company…bought me a camera and put it on the first flight out this morning. And to beat it all, the airstrip is only like a few minutes from where we are staying so it was convenient enough. Plane lands and pilot comes out with Nikon box in his hand as he steps off the plane…hands it to Ally as I am screaming thank you and he told me to take lots of beautiful pictures. So now, 2 of the three batteries are charged and I am set to go. I have beaten myself up about this so much. Of all the stupid things I brought that I didn’t need, how could I do that? Ally told me that’s when we are reminded we are all but human…no one is perfect. So, if anyone is in search of a Nikon…lol! Ok, enough of that story. So we left the camp this morning and drove down to the lake, just to catch the sunrise over the lake. What a sight to see. Rich has commented several times that there has been a full moon here every night, how is that possible? We drove around the lake and saw remnants of the many animals that have lost there lifes around this water. Sort of sad when you think about it…coming to just get a drink of water…lifes n necessity … and your life is cut short. As we went on around the lake we saw a Cheetah, just walking along the edge of the water. She kept looking at animals on the other side, probably wondering how she was going to get over there. Then, she just laid down and enjoyed the breeze. Sat and watched her for a while than went on our way. Lots of other adventures to take. Again, I can’t begin to tell you how dusty it is. Rich said he has sneezed more in these 5 days then he has in months. Just like yesterday, Ally turns onto this isolated road that honestly looks like it’s going no where, but who are we to question him, right? 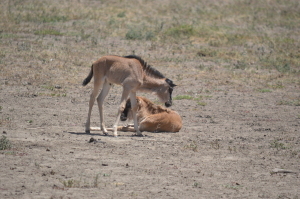 We drove FOREVER, only seeing Gazelles, Zebras and a few Wildebeest here and there. 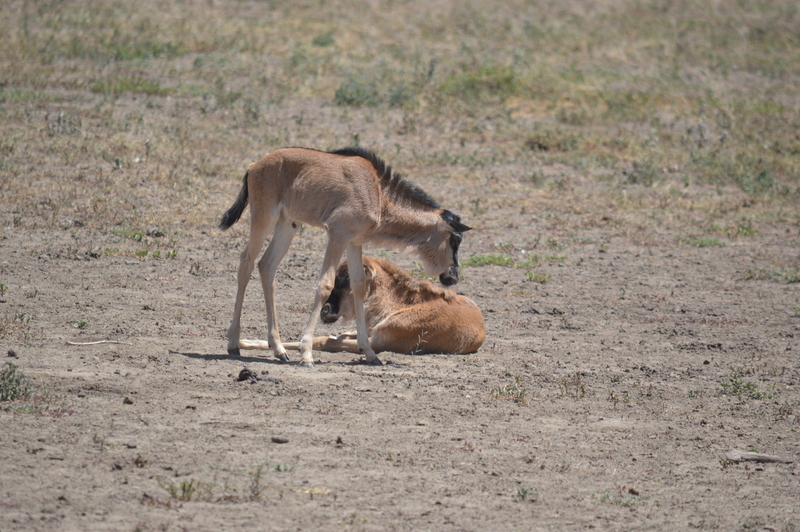 He told us we were driving to see some herds of Wildebeest…ok, better be worth it. And OMG…once again our socks were blown off. 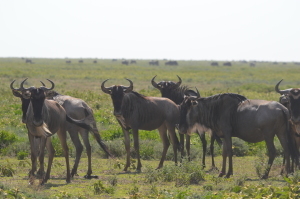 It wasn’t a just a herd of Wildebeest, this was seeing them in full migration. They estimate there are between 2-5 million here in Africa. Pretty sure we saw at least 4 million of them today. They went from as far as you could see left and as far as you could see right, just all walking in the same direction. It looked like everyone other one also had a new baby. It was one of the most amazing things I have ever seen. Any picture or video we have taken can not truly capture the moment. Headed back towards the camp for lunch and a little siesta before we hit a late afternoon drive. Ran across another pride of lions just chilling under a tree. This group has a couple younger adolescent lions, but still no cubs to be seen. Still have 5 days for that. Back at camp had a great lunch, recharged all of our stuff, Rich took a nap and I am finishing the 1st 1/2 of the 5th day here. Maybe I can keep up now. Part 2 of 5th day. Our afternoon drive was all the way around the lake. The terrain here is more like I pictured Africa would be. We saw a zebra and a baby zebra who had died of what appeared to be natural causes. So very sad. We then spotted a leopard laying in a tree. It was amazing to see how he was holding himself up there. A few monkeys, lots of birds and the norm, zebra & giraffes. Back at camp at 6 with an hour to get ready for dinner. Shower was much needed tonight because of all the dust. Dinner tonight was exceptional. 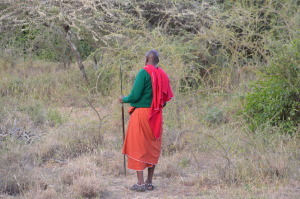 Learned tonight that in Tanzania, a man can have as many wives as he wants…Rich thought that was ok, me not so much! Glad to hear Ally say that was not for him, he could not split his heart. You are a good man Ally! 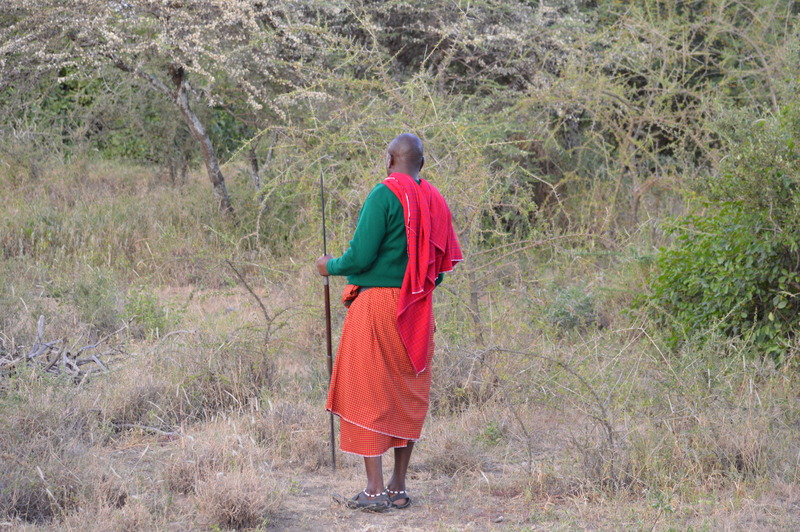 As we were being escorted back to the tent tonight, two different warriors led the way – both with flashlights. I know there were buffalo spotted on camp today. As we turned the corner to our tent they spotted two buffalo right in front of our tent. I was video taping the entire walk back so I caught it all. They went into the bushes to flush them out but we never actually saw them leave. From there on, all escorts tonight were by golf cart. Rich was finally able to reach Linda this evening by phone, but we continue to have problems with the internet connections here. Limited at best. Posting pictures is a problem but Ill try. Will try to post day 4 and 5 tomorrow. We are starting at 7 tomorrow. I’m going to try and sleep tonight. Sounds amazing. Can’t wait to see all the pictures and hear the stories. Luv you both. I miss you Rich but I know you are having a great time. See you on Saturday. All my love and be careful PLEASE. Its a nice blog posted by you. I was seeking for this type of blog that have a fresh and inrteesting content. I also have a really nice site which is very helpful to people who are seeking for Swimming Pool Products. Please have a look on it. #2 Assino onde?Como Ã© bom ler o Impedimento. Chega ser chato esse monte de elogio, mas Ã© merecido.Ninguem fala desse que Ã© um dos maiores clÃ¡ssicos sulamenricanos no resto da imprensa.EstÃ¡dio em extase, torcidas ensandecidas, camisas que pesam uma tonelada cada! Ah, e LF, tu, quando reportas, Ã©s excelente. ParabÃ©ns! 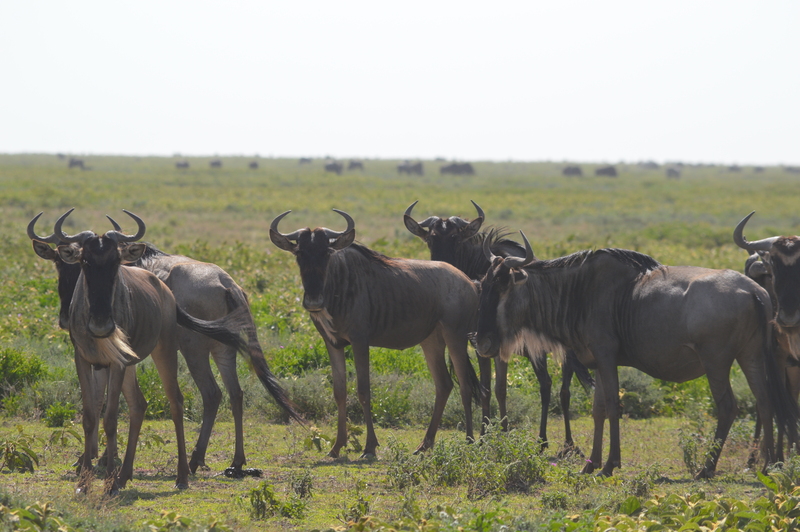 Had no idea what a Wildbeast was, looked on the internet and can’t believe you actually saw this herd. How amazing. Can’t wait to see your pictures and videos. I know you are so enjoying your trip. You can tell by your blog.